I have a Costco American Express card that I rave about to everyone I know. The amazing purchase protection features have come in very handy, and their customer service can't be beat. I also know that credit cards aren't for everyone, which is why I'm so excited to see that American Express has a brand new American Express Prepaid Card which is a no-fee reloadable prepaid card that you can use just like a credit card. Let me tell you, this card is SO much better than almost any other prepaid card out there! I've never seen one offered with so few fees and truly great perks! The prepaid card is loaded for free with an online bank transfer. You just enter your bank's routing and account number, and the money is added to the card. Once it's all set up the card will ship to you for FREE! Now through the end of June, you'll get a $25 bonus American Express gift card when you start off by loading $200 on your new card. That's a 12.5% return on your $200! I'm ordering up a card right now with $200 on it so I can get the $25 bonus. I can pay my cell phone bill or my internet bill online with an American Express card, and I know I can overpay on a payment to use the entire balance of the card at one time. You don't need a promo code to get the extra $25, and you don't need an American Express account to get this card. If they ask you to log in with your American Express account details, you can skip the step if you don't have an Amex credit or bank account. Offer is available to everyone. “Limit one $25 gift card per new Card user named on a Card.” You are allowed 3 prepaid cards per person, so that’s a potential bonus of $75 if you have a different user named on each card. You could get one for you and for your kids, or one for a trusted family member if you can work out an arrangement. After upi get your cards, use them prepaid cards to pay for your everyday purchases. You'll even get one free ATM withdrawal per month if you can find an fee-free ATM that won't charge YOU for the withdrawal. 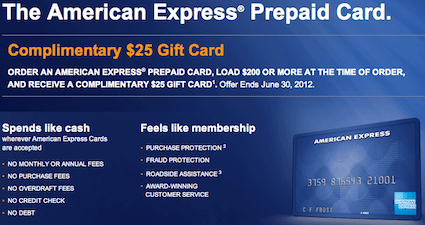 Order your American Express prepaid card here! How do you add the extra people to get the extra $50? Do you have to wait until you get the card? Will it be too late then since it will be July?